Here we are at post #2 of Pomegranate Week 2010!!! 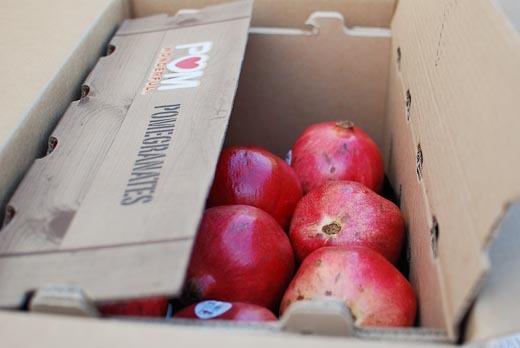 When I was selected to be one of the POM Dinner Party Hosts, I was mailed a box of beautiful red pomegranates. I can’t even tell you the excitement that I felt as I opened the box!!! 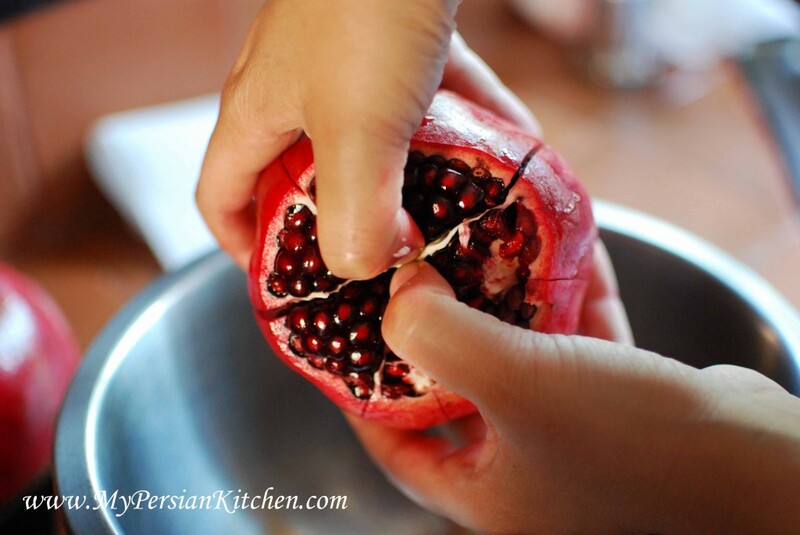 For the party I had to start from scratch and seed the pomegranates and juice them for a couple of my recipes. 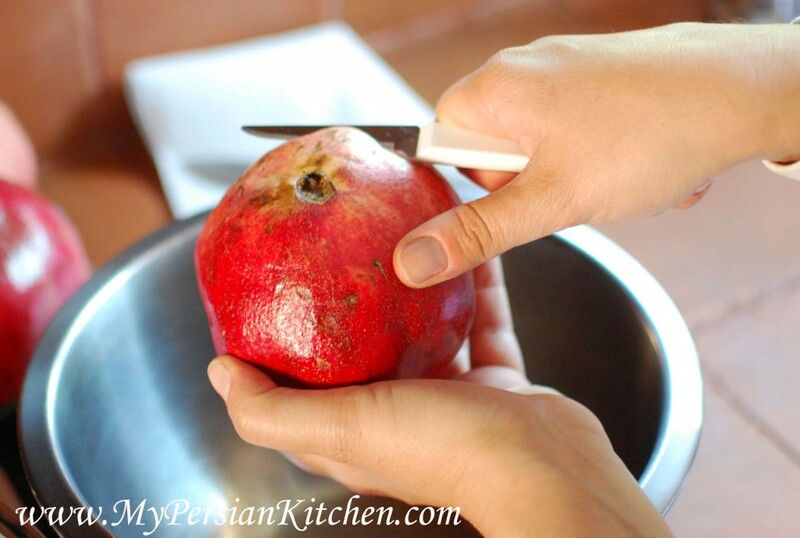 Most people think that opening a pomegranate and removing the arils is hard. Actually is not that hard and a while back I finally figured out how to do it efficiently. 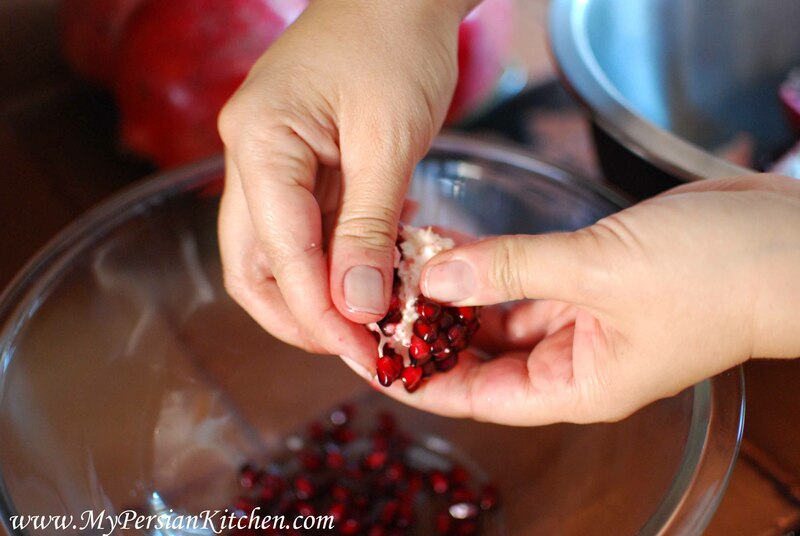 I like to use two bowl when I seed my pomegranates. I use one for the arils and the other one for the membrane and peel. I also like to use my small paring knife that is easy to maneuver because it’s light and is also very sharp. I also like to have another heavier knife handy. 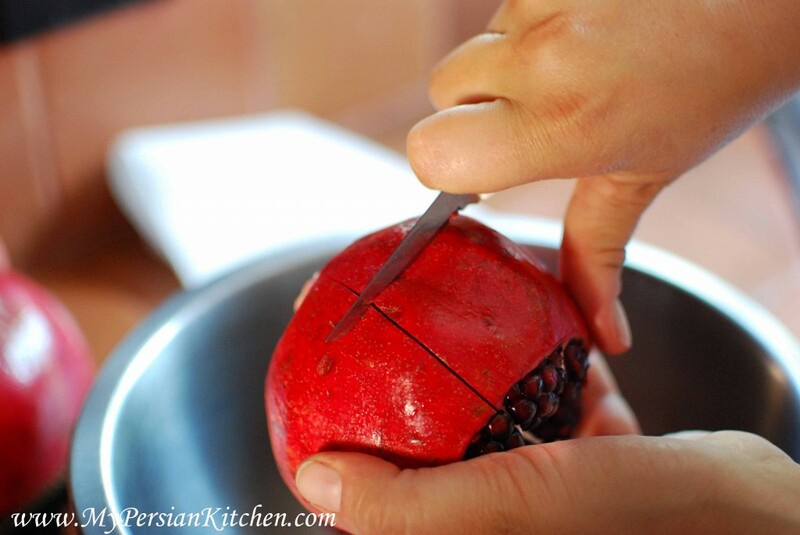 The first thing I do is cut the top portion of the pomegranate with a paring knife. Don’t cut all the way through, just make an incision and go around. 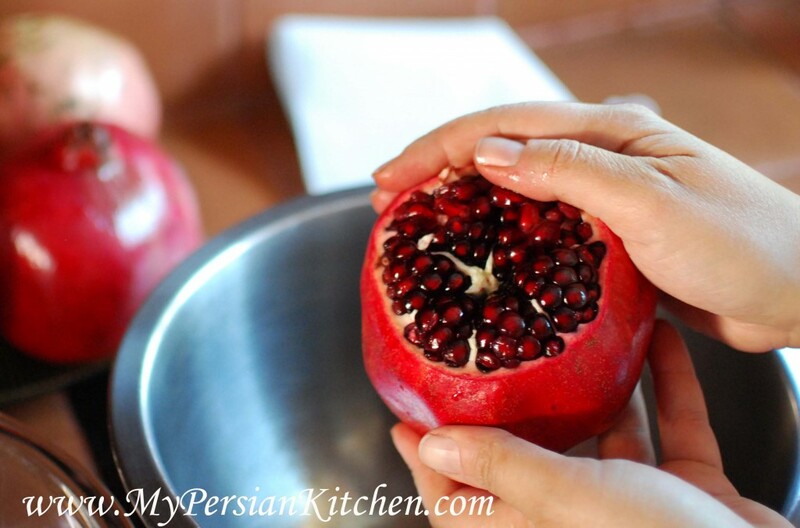 Do the same thing to the bottom of the pomegranate. With a heavier knife remove the top portion of the pomegranate. At this point you can also remove the bottom part. 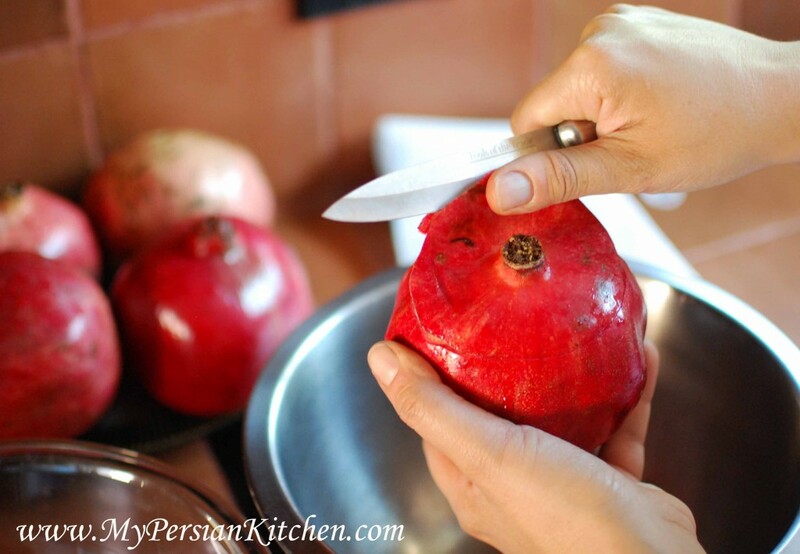 With you pairing knife remove the albedo, the white flesh under the skin, from the center of the top of the pomegranate. 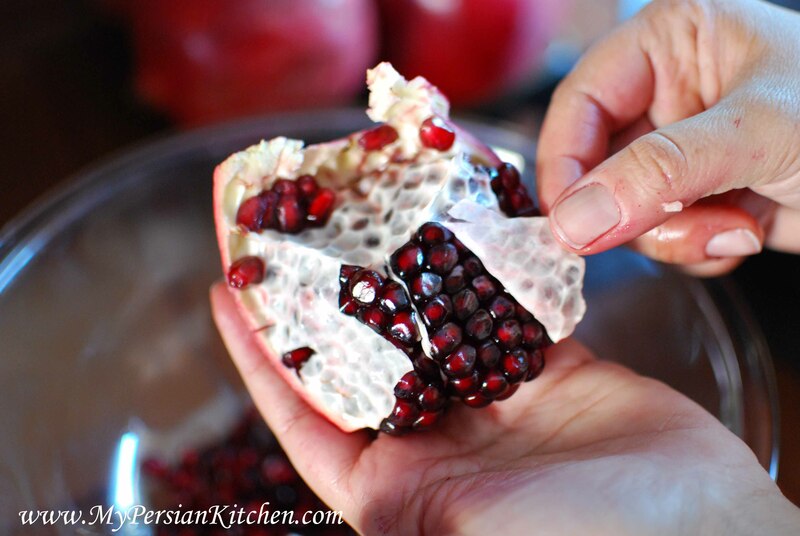 The pomegranate is naturally divided into sections by the membranes. Score the pomegranate from top to bottom on each section using the membrane division as your guide. 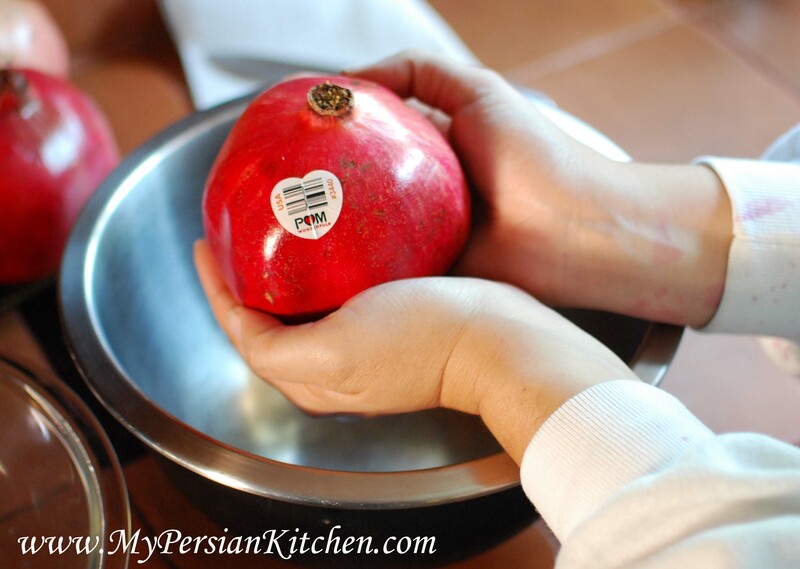 After scoring the pomegranate vertically, now score it once horizontally right in the middle. Place your thumbs in the heart center of the top portion of the pomegranate. 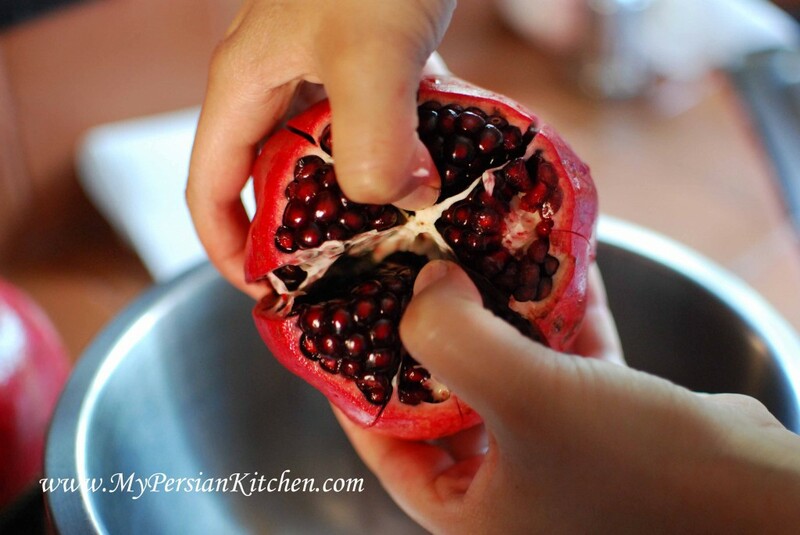 Gently wiggle the pomegranate open. Peel back and remove the membrane on section and divide into smaller pieces. Peel back and remove the outer skin. With you thumbs gently remove the arils and drop them into your second bowl. Try to be as gentle as possible so that the seeds don’t bursts. Some choose to use a bowl of water during this process, but I prefer not to because I think water take away a bit of the taste. You’ll surprised that it’s not that hard to keep the white stuff out of the bowl. Now I have something new to share with you guys. I decided to also make a video of me peeling one of the many pomegranates that I seeded for the party. My old white sweatshirt became my uniform for the pomegranate massacre. My mom and the Sous Chef teased me to no end because I had pomegranate juice all over me, my hands, wrists, face, sweatshirt, counter, and wall!! Anyway, here is the first every video of yours truly. Great way to deseed– I’ve never seen it done this way. 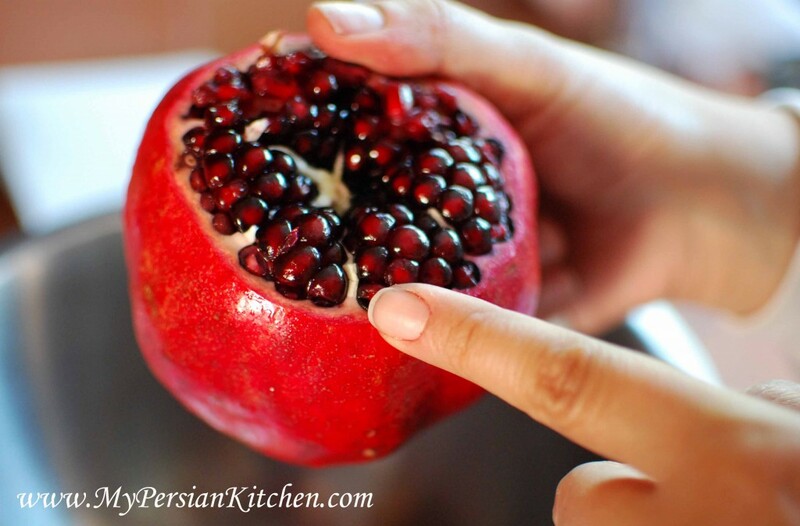 I actually just posted a video tutorial on my blog on how to de-seed a pomegranate. I love them, they’re so delicious and my favorite is in fesenjun!! Karen, thanks so much! It took me a few tries until I came up with the most practical way to open them! But it works well for me! a less painstaking but slightly messier way is to score the pomegranate all the way around with a knife, prying it apart at the blossom end so you have to halves. put the cut end in your palm and over a bowl, beat the fruit with a heavy spoon. the seeds fall right out! Great post! 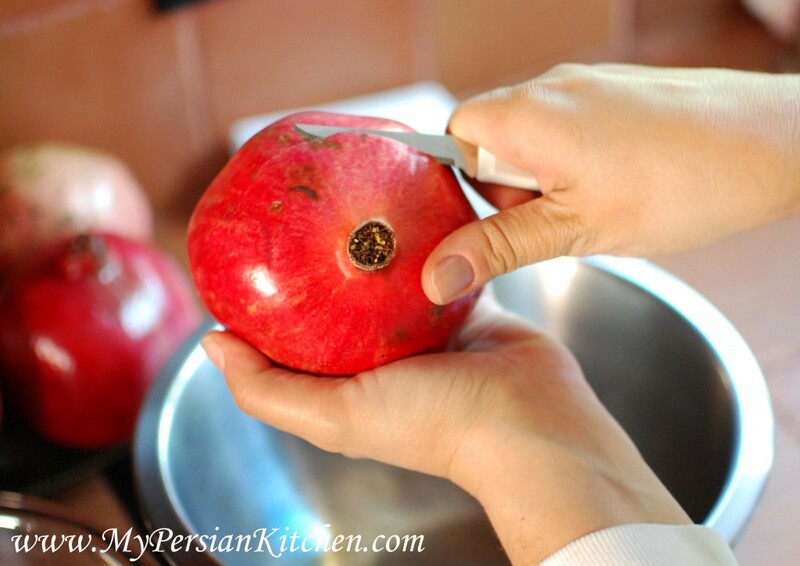 I did want to add that I found a way to peel a pomegranate without the ruby red juice stains all over…fill a large bowl 1/2 way full of cold water. Score the sides of the pomegranate into eight sections and cut off the top and bottom of the rind and place it uncut but sectioned into the cold water. 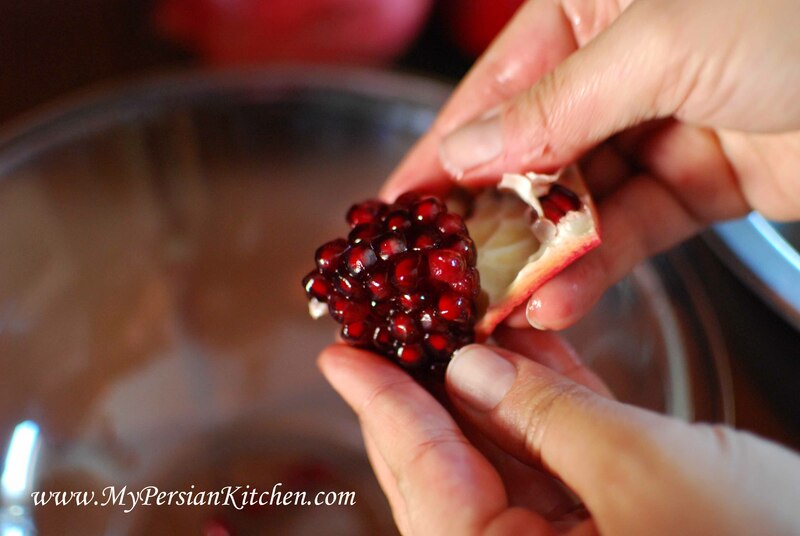 Once the Pomegranate has soaked in the cool water for about ten minutes, you should be able to separate the skin from the white stuff…The bad seeds and white stuff tend to float, making separating the good/bad seeds much much easier! This has saved me tons of time during clean up…hope it is a clear enough explanation! Janelle, thanks for your method. But personally, I don’t like to soak my seeds because I think water takes away from the taste. Cut in half. Get a wooden spoon (you need the weight). Hold the pomegranate over a bowl and tap the skin with the spoon, quite firmly. Tap all around the edges. The seeds will fly out into the bowl (without the pith). It’s really fast and at the end, you shouldn’t have any seeds left. Squeeze the half to get the rest of the juice out, if there’s any left. It’s fast, not messy and easy. 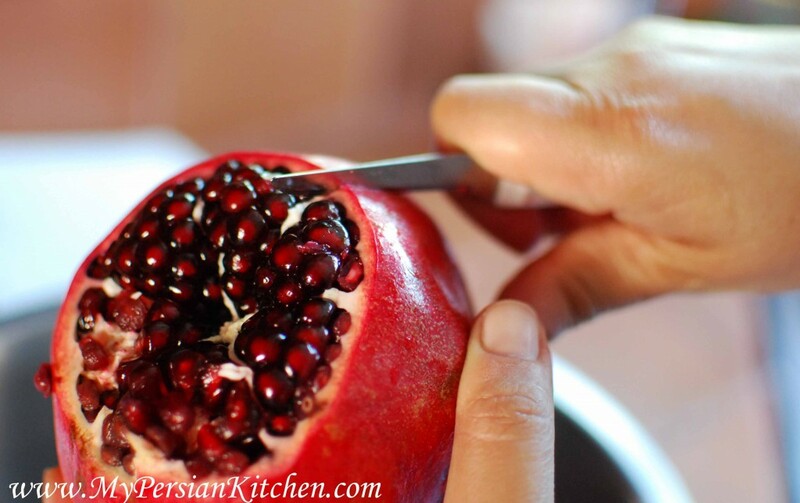 The best and quicker way of getting seeds out is cut pomegranate in half and with a rolling pin knock them out quick easy hassel free. I read this and thought…how messy could it really be? Haha!!!! The other day I found out! But it was well worth it. Thank you so much for taking the time to share such wonderful food, ideas, and culture! I LOVE this site!!!! A lot less work! Now we put them on everything.